Written by and published with permission from Matt Stevenson @ Connected Frequencies. Happy New Year to all! Another year gone by with technology of all kinds advancing in leaps and bounds. The collaboration and unified communications industry saw no exception to this growth. To name a few things, in 2016 we saw things like Acano being acquired by Cisco for integration with the Spark platform, Microsoft continuing its expansion into the UC space with big growth in Skype for Business, and Slack taking the world by storm, making us all rethink email and text communication. 2017 will be no different with some new platforms coming of age and a continued shift in the way technologies are deployed. Let’s take a look. It has been a headline for a few years now: the hardware video endpoint is dying. While it will be some time before the dedicated endpoint is truly dead due to the needs of larger enterprises with conference rooms and meeting space that only a hardware endpoint can fill, the new “endpoints” are your computer and your mobile device. In times where everyone has an endpoint and networks are more robust than ever, even larger businesses are looking to reduce spending on expensive, room based hardware. Companies like Logitech have been doing well making webcams for personal use and more recently, devices for the conference room in their “ConferenceCam” line. Look for them to continue to push this tech, but in 2017 look to new entrants in this space. One newcomer is Huddly, promising high quality video meetings for small to medium sized groups with a wide angle camera that is small and portable. Another is a product from Owllabs which is more like a smart camera that creates an immersive experience via intelligent participant tracking and software that smoothly transitions from one speaker to the other, all in a small, low cost package. With more and more video calls taking place via software these days, I see these affordable devices with improved features having big growth this year. Video collaboration has traditionally been a planned, outbound experience. Here participants know they need to do a call, schedule it in advance, and one party calls another at the desired time. As things have advanced participants meet in a virtual meeting room, where the experience is more flexible, but still usually a planned experience. As more open technologies emerge and technologies like WebRTC improve, this is opening up a world of possibilities for a more inbound experience. We first saw this in a big way a few years ago when Amazon launched its Mayday service, an inbound mechanism designed as product support for customers using Amazon tablets. Amazon tablets didn’t really take off but the idea was great. Fast forward a few years and today’s web is ready for inbound video. With API’s from companies like Pexip and Tokbox allowing you to create your own video experience in a browser, there are endless possibilities here. HR, marketing, sales, and support teams could do quite well with a way for customers to contact them (inbound) over video, and each day there are more companies looking to embed video calling into their web products. There are solutions out there today, but this is essentially an untapped market. I see lots happening here in 2017. The last few years were supposed to be “the year or WebRTC”, the video standard that allows for video calls within a web browser, yet the technology still isn’t quite there. It is absolutely amazing when it works, but there are many places that can cause failures. Participants not being able to see or hear is still rampant due to device problems and user error. But the main issue is that not all web browsers fully support WebRTC, those that don’t require plugins, and we unfortunately still have a lot of people using Internet Explorer (!) which has never really provided a good experience for video in this way. Things are changing here with IE fading more quickly with Microsoft launching their new Edge browser last year. Also in 2016 Apple announced support for WebRTC in their browser Safari. While WebRTC on Safari on the desktop isn’t the biggest deal on the desktop with Apple having only a small share of that market, what is a big deal is WebRTC support on Apple’s mobile devices iPhone and iPad in which they do have a big market share. While this all sounds great, it is unlikely that in 2017 we will see this change. Apple has always been strict when it comes to battery life, and WebRTC has been known to be a battery and bandwidth hog depending on how it has been implemented. Combine this with the fact that most Android devices don’t have the hardware or software required for a good WebRTC experience and you can expect that WebRTC will continue to grow on desktop this year, but overall, not as much as it could if it truly shined on mobile. Recording and streaming, a feature once only available to large enterprises with the money and deployment to support something like the Cisco Content Server, is now more accessible to all. As nearly everything in the tech space moves to the cloud, so does recording and streaming. As we know, cloud services are much easier to deploy and maintain and allow more ROI for customers than on-prem equipment. As equipment costs continue to drop, storage and bandwidth costs go down, allowing large video files which were once a burden to IT to float in the cloud, accessible at any time. More importantly, now any user can have access to recording and streaming which was once limited to a select few due to technical and logistic restraints. With these improvements, the uses of these tools can be more realized. 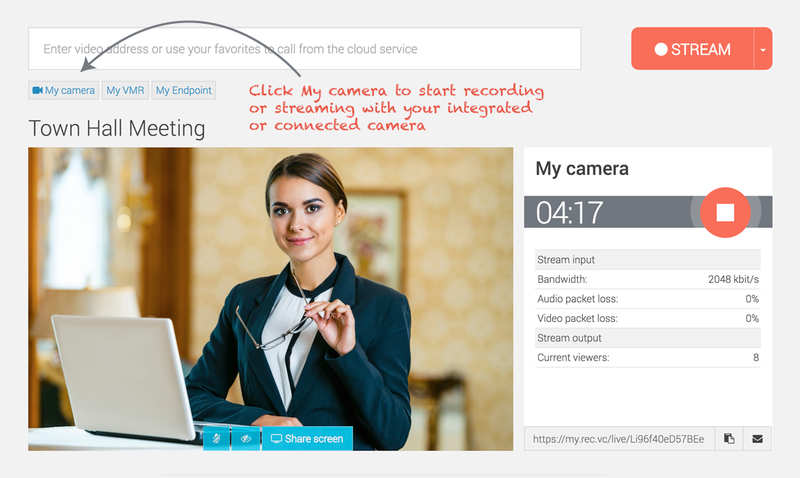 Once only for the simple task of recording a video meeting for future playback, calls can now be recorded as well as streamed to large audiences on any device including mobile, allowing anyone in a business to join a large all hands call without the cost of having everyone actually join the call. Other uses that will grow are recording short messages for a team or team member, almost like a pseudo video voicemail we’ve all talked about for a while. Better still, any user whether it’s someone HR creating an internal announcement, someone from marketing creating a customer facing video, or someone from IT recording a training, anyone can create a video in seconds using the equipment they have right in front of them, stored securely in the cloud for easy access and sharing. Look to REC.VC from MNS leading the pack here with a cloud platform that offers superb quality, security, and features in a dead simple user interface. Microsoft continues to gain ground in the UC space with the way they offer and market Skype for Business (basically free with other Office/O365 products). It is hard for an IT manager to say no to this price when other solutions technically cost much more and don’t offer tight integrations to Microsoft’s Office Suite. With this unified experience and the visual refresh taken from Skype finally completed last year in updates to the mobile apps and Mac app, more orgs are turning to Skype for Business for their needs. While it is a good solution to a point, the biggest issue has been interop in that S4B users often can’t call people on different devices and protocols. The solution works great if you’re only talking to others with Skype for Business but that simply isn’t the world we live in. In today’s connected world you need to be able to call more than just those using the same software as you do. Enter Pexip, likely the current leader video conferencing interoperability, especially when it comes to Skype for Business. This is on top of an already robust, cutting edge platform that is advancing more rapidly than most on the market. Their Skype for Business gateway functionality allows S4B users to easily call other devices with all the interop magic happening in the background. Pexip is the perfect solution for what S4B is lacking. It is a wonder why Microsoft has not made a deeper partnership or outright purchase of Pexip. Even a business outside of Microsoft would do well in acquiring Pexip just to make use of the S4B interop. Either way, expect more purchases in this market throughout 2017. As buyers require their apps to be more unified, we’ll see more acquisitions where “older” businesses trying to keep up with competition make purchases of video centric solutions in attempts to patch together unified solutions based on one or more products they already offer. I agree with Rowan Trollope of Cisco here. 2016 was the year of Slack with its frictionless approach to chat, sharing files, and more recently, voice and video calling. Thousands of teams and companies hopped onto the platform as many pundits declared email to be dying in the wake of Slack’s growth. While that might be somewhat far from true, what can’t be denied is that Slack and apps like it are here to stay. Cisco is trying to emulate in Spark as is Microsoft with their Teams service. Even Facebook getting into the game with “Workplaces”. So how does this affect video collaboration? It all goes back to that magical word: unified. In the past multiple separate apps were used to do different things; one for chat, one for screensharing, and so on. Today the demand is to have all communication needs served in one tool. This will drive acquisitions as mentioned above as providers attempt to offer the best complete solution being that most “UC” solutions started with chat or voice and are looking to add a better video experience. Keep in mind that while many solutions are getting better by adding video, they still lack a lot. Slack’s video calling for example is limited in that the same way as Skype for Business. Sure, you can have a video call with anyone on your Slack team, but try to call someone using something other than Slack and you’ll run into a problem. You can add others on Slack to your own team but this isn’t ideal. Where Slack excels here is their integrations which include other video services like Zoom/Google Hangouts. This brings you out of the Slack app into another, but at least gets the desired experience. To recap, I’m seeing increased need for more than just internal video calling which is where Slack and other similar solutions are lacking, and this year more apps of this type will either add video or be added to existing video solutions. Many changes ahead. SPARKS FLY AT CISCO, BUT WILL THERE BE FIRE? Cisco Spark, which launched in late 2015 as “Project Squared” spent a lot of 2016 being tested and talked about especially in light of the acquisition of Acano, which will most certainly be used as Spark’s video and interop engine under the hood. With ability to create separate rooms to chat, share files, screen share, and launch video calls, it sure sounds like a great solution. The ability to register hardware endpoints is a plus for some as well. In its current form, Spark has not really lived up to the hype. It is known to be buggy in certain areas and like other solutions mentioned above has a lot of friction when it comes to external calling with users who don’t use Spark or have a video endpoint. This could all change when we hear about Spark 2.0 later this month, presumably featuring the under the hood changes with Acano as well as a UI overhaul. But will Spark catch fire right away? Cisco has traditionally been slow to integrate acquisitions into their products while at the same time making decisions that confuse and sometimes irritate customers. One of these decisions is that only brand new Cisco endpoints with specific hardware will be able to register to Spark, leaving customers with lots of Cisco devices that want the whole Spark experience need to buy all new endpoints or use Spark along with their older infrastructure. Let’s not forget Cisco charges a premium for its products. Cisco will of course onboard many enterprises to Spark with deep discounts as they’ve done in the past but unless Spark 2.0 is technically solid and a major hit right away, it might be another year before it sees large scale adoption. Call me skeptical at this point. This is just a taste of the many things to come in 2017. I’ll be following it all here so please be sure to check back and would love to hear your comments for discussion!